The Three Faces of Eve ((1957) starred Joanne Woodward playing a woman suffering from multiple personality disorder. In David and Lisa (1962) Keir Dullea played the part of an institutionalized teenager. In Snake Pit (1948)Olivia De Havilland famously portrayed another patient suffering back in the days when mental institutions and penal colonies were indistinguishable. David Cronenberg goes back to Cosmo Topper (Leo G. Carroll) in portraying the founder of psychoanalysis in A Dangerous Method. Carroll as you may remember played the venal Dr. Murchison in Spellbound, but people associate him more with the 50’s television series, in which he really was a sweet old fellow, rather than the l945 Hitchcock movie. Actually the character of Jung (Michael Fassbender) and Freud (Viggo Mortensen) both seem to owe a debt to Leo G. Carroll with the once swashbuckling but eventually doddering Jung (Topper) having to deal with a manipulative psychopathic Freud (Murchison) who gets the upper hand in discussions by treating his one-time follower and in fact anyone who disagrees with him as a patient. Keira Knightley as Sabina Spielrein, the patient, who is treated by Jung both psychiatrically and sybaritically (as in treated to a good time which means giving her thrashing she likes) falls off the charts in her depiction of what we can suppose to be hysteria. Hysteria, an affliction that Freud recorded in many of his famous cases (Anna O is one of the most famous) is reduced by Cronenberg’s to a rendering of something that might have afflicted one of the characters who drank too much and was about to vomit in say Animal House. It’s really a triumph of filmmaking when you can take a significant piece of the past and make it look like the Pleistocene era. 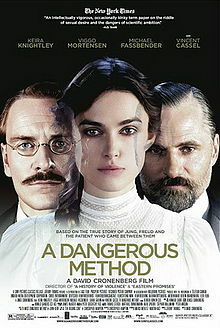 But A Dangerous Method is not just a period piece, its success comes from taking major themes and discussions like that of libido, the death instinct and the ego and reducing them to the level of comic book balloons. Rather than hiring a whole cast of expensive actors, Cronenberg would have done better to deal with a seminal moment in psychoanalytic history by creating an animation with perhaps Batman as the dashing Aryan, Jung and say The Joker as Freud.